Entry, descent, and landing technologies ensure precise and safe landings. Engineers faced the daunting task of slowing the Mars Exploration Rover spacecraft from about 12,000 miles per hour when they entered the atmosphere to about 12 miles per hour when they hit the surface of Mars. 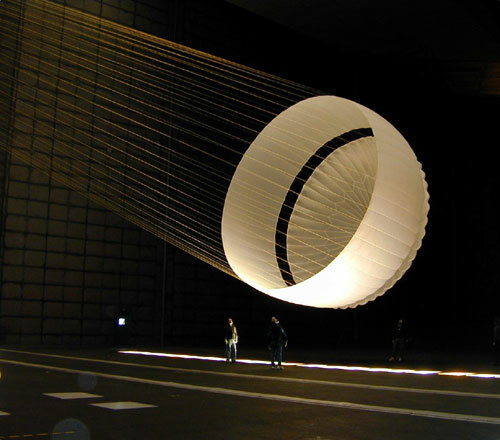 A test of the Mars Exploration Rover parachute in the world's largest wind tunnel at NASA's Ames Research Center. For entry, descent, and landing, the mission inherited much from its martian predecessors, Viking and Mars Pathfinder. In order to slow the spacecraft down, the mission uses inherited parachute technology from the Viking missions of the late 1970s, which translated well for 1997's Mars Pathfinder mission. For the much heavier Mars Exploration Rover mission, the parachute's basic design remained the same but is 40% larger in area than Pathfinder's parachute. 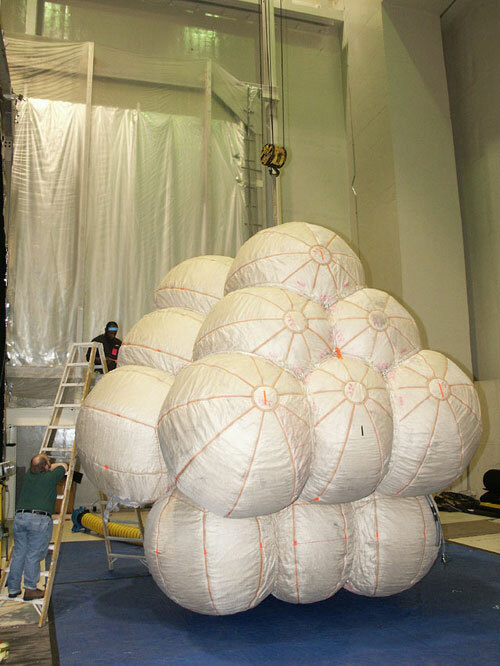 The same cluster of airbags that softened Pathfinder's landing also cushioned the Mars Exploration Rovers. Twenty-four lobes that, when fully inflated, look like a massive bunch of white grapes, surrounded the lander, with the rover cradled inside. The airbags are made from a very durable, synthetic material called Vectran. On the human spaceflight side of NASA, this same material is used to make spacesuits. Again, the weight increase from 1997's mission called for a re-design of the airbags. Multiple drop tests proved that the additional mass was causing serious abrasions and tears. Engineers designed a double-bladder airbag that resisted these mission hazards, caused by the high speeds at which the rover package lands and rocks and other geological features it may encounter. The fully inflated Mars Exploration Rover airbags stand about 18 feet (5.5 meters) high. Each rover used four airbags with six lobes each, which are all connected. Connection is important, since it helped abate some of the landing forces by keeping the bag system flexible and responsive to ground pressure. The fabric of the airbags was not attached directly to the rover; ropes that crisscross the bags held the fabric to the rover. The ropes gave the bags shape, which made inflation easier. While in flight, the bags were stowed along with three gas generators. This image, taken by the descent image motion estimation system (DIMES) camera located on the bottom of the Mars Exploration Rover Spirit's lander, shows a view of Gusev Crater as the lander descends to Mars. The picture is taken at an altitude of 1,433 meters (about 4,701 feet). 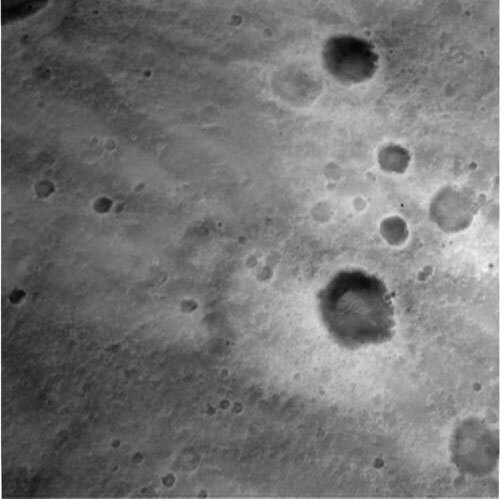 Numerous small impact craters can be seen on the surface of the planet. These images help the onboard software to minimize the lander's horizontal velocity before its bridle is cut, and it falls freely to the surface of Mars. To slow the rover package before it hits the surface, three rocket-assisted descent (RAD) motors were designed for use if necessary. A radar system on the lander was able to detect distance from the surface. When the craft were about 2.4 kilometers (or about 1.5 miles) above the surface, the radar system alerted the Descent Image Motion Estimation Subsystem (DIMES). This camera took three pictures of the ground about four seconds apart and automatically analyzed them to estimate the spacecraft's horizontal speed. Moments later, a secondary propulsion system that was new to the Mars Exploration Rover mission fired during Spirit's descent. As predicted, Gusev Crater winds were fierce and moving Spirit from side to side, impeding a safe landing. The Transverse Impulse Rocket System (TIRS) counteracts horizontal movement, thereby making the craft more stable for landing. Windy conditions were not predicted for Opportunity's Meridiani Planum landing site, so Opportunity did not fire its TIRS system.